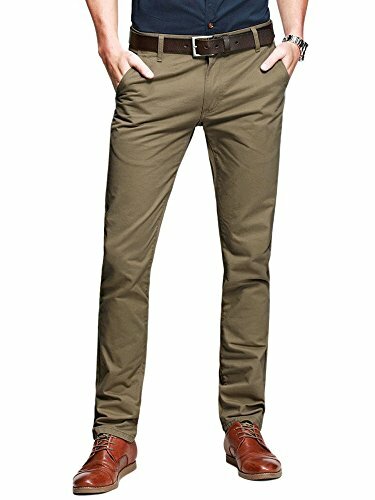 Men's breathable chino pants is designed with straight leg cutting and dual stitch craft, which might be the most comfortable and durable pants you'll ever wear. Must-haves style for work and casual wear in spring and autumn time. 2.Please choose the larger one if you are hesitate between two size. 3.Please offer us your detailed size info (e.g:height, weight,waist) if you need suggestions. 4.Please consult Nature.Z customer service team directly if you have any other doubts. Lable Size 29: Waistline 29.3"/ Hip 37.1"
Lable Size 30: Waistline 30.5"/ Hip 38.3"
Lable Size 31: Waistline 31.7"/ Hip 39.5"
Lable Size 32: Waistline 32.9"/ Hip 40.7"
Lable Size 33: Waistline 34.1"/ Hip 41.9"
Lable Size 34: Waistline 35.2"/ Hip 43.0"
Lable Size 36: Waistline 36.8"/ Hip 44.6"
Lable Size 38: Waistline 38.4"/ Hip 46.2"
Lable Size 40: Waistline 40.0"/ Hip 47.8"
If you have any questions about this product by OCHENTA, contact us by completing and submitting the form below. If you are looking for a specif part number, please include it with your message.